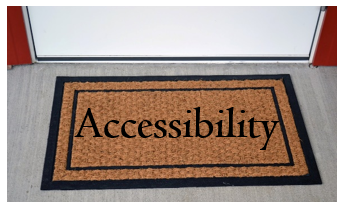 We live and breathe accessibility at Accessibility Partners. One of our primary corporate values is to create a company that promotes inclusivity in all spaces. This website is our welcome mat to the world. Our message of disability advocacy, inclusion, and accessibility is one we want all people to receive. We have designed our website with a few principles in mind. One of Accessibility Partners’ chief focal points is to increase the presence of people with disabilities in all stages of our business. Accessibility Partners also values collaboration, and that is something we do not reserve only for our staff. On every client engagement, we work with technical teams, compliance experts, human resources professionals, attorneys, and more, to help foster more accessibility in their technological products and services. Primarily, we strive to adhere to the standards of the Web Content Accessibility Guidelines (WCAG 2.0) of the Web Accessibility Initiative (WAI) of the World Wide Web Consortium (W3C), Section 508 Amendment to the Rehabilitation Act of 1973 with current 2018 updates, the Americans with Disabilities Act (and subsequent amendments), the 21st Century Communications and Video Accessibility Act (CVAA), and other standards of accessibility and usability. We also follow best practices from our internal staff, and how they interact with web content and their assistive technology. Accessibility Partners appreciates and values that there is no such thing as a typical user. Therefore the optimal web experience varies from person to person. We have tried to create a balance with our current website. Still, technology, especially within website content, is changing rapidly. As we work with some of the brightest innovators we are privileged to have as clients and colleagues, there are trends that may supersede our updates. Our users employ ever-evolving pieces of assistive and adaptive technology to access the Internet, and we work to accommodate each of them. Another corporate principle of Accessibility Partners is to provide our staff with the technology that works well for them, and accommodating their needs. By employing a committed Bring Your Own Device (BYOD) policy, our staff stays productive as we help our clients on their quest for accessibility. We have a fervent belief in empowering our users with the technology that fits best with their disability. Accessibility Partners strives to provide an inclusive web experience for a user of all abilities. We want to hear if you have any suggestions or tips on how to make the web a more inclusive place. Additionally, if you have difficulty accessing any portion of this site, please e-mail us at Info@AccessibilityPartners.com or call us at (301) 717-7177. We would be happy to assist you.